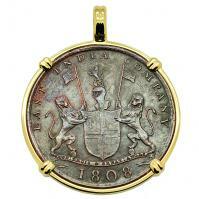 British 10 cash dated 1808 in 14k gold pendant, 1809 British East Indiaman Shipwreck. 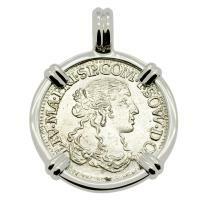 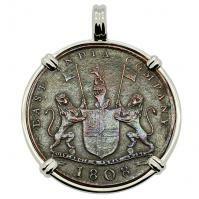 British 10 cash dated 1808 in 14k white gold pendant, 1809 British East Indiaman Shipwreck. 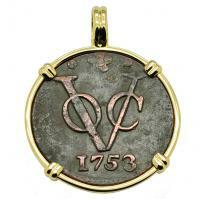 Dutch East Indies Company VOC duit dated 1751 in 14k gold pendant. 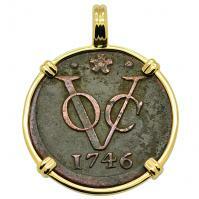 Dutch East Indies Company VOC duit dated 1746 in 14k gold pendant. 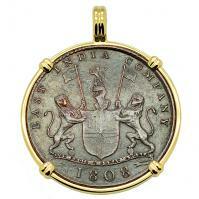 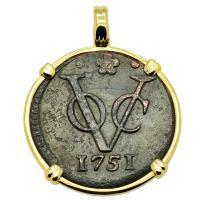 Dutch East Indies Company VOC duit dated 1753 in 14k gold pendant. 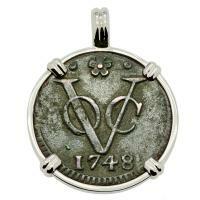 Dutch East Indies Company VOC duit dated 1748 in 14k white gold pendant. Dutch East Indies Company VOC duit dated 1746 in 14k white gold pendant. 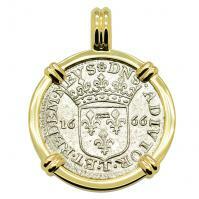 Dutch 6 stuivers ship shilling, dated 1774 in 14k gold pendant. 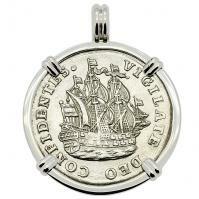 Dutch 6 stuivers ship shilling, dated 1792 in 14k white gold pendant. 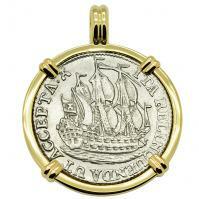 Dutch 6 stuivers ship shilling, dated 1754 in 14k white gold pendant. 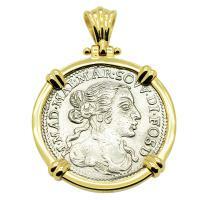 Dutch Ducat dated 1724 in 18k gold pendant, 1725 East Indiaman Shipwreck Norway. 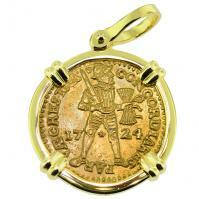 Dutch Ducat dated 1729 in 14k gold pendant, 1735 Dutch East Indiaman Shipwreck Zealand. 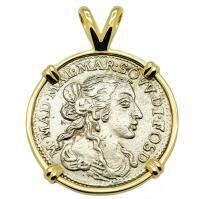 Dutch Ducat dated 1729 in 14k white gold pendant, 1735 Dutch East Indiaman Shipwreck Zealand. 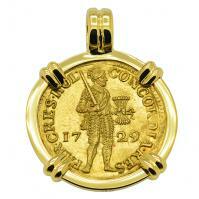 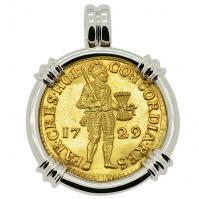 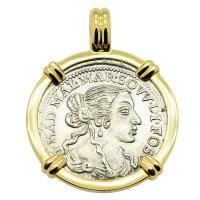 Dutch Ducat dated 1729 in 18k gold pendant, 1735 Dutch East Indiaman Shipwreck Zealand. 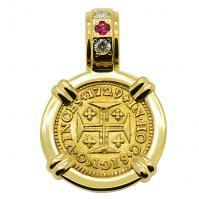 Portuguese 400 Reis dated 1729, in 14k gold pendant with diamonds and ruby. 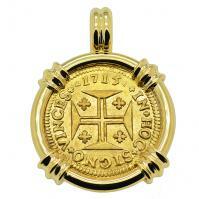 Portuguese 1000 Reis dated 1715, with cross and crown in 14k gold pendant. Portuguese 1000 Reis dated 1713, with cross and crown in 14k white gold pendant. 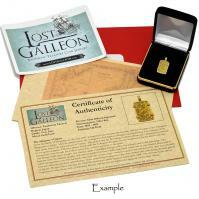 Italian Luigino dated 1667 in 14k gold pendant, 1667 merchantman shipwreck Gela Sicily. 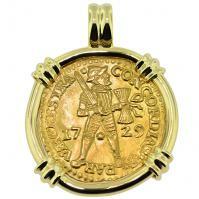 Italian Luigino dated 1666 in 14k gold pendant, 1667 merchantman shipwreck Gela Sicily. 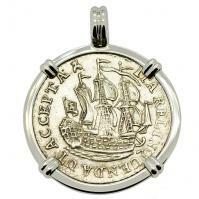 Italian Luigino dated 1666 in 14k white gold pendant, 1667 merchantman shipwreck Gela Sicily.